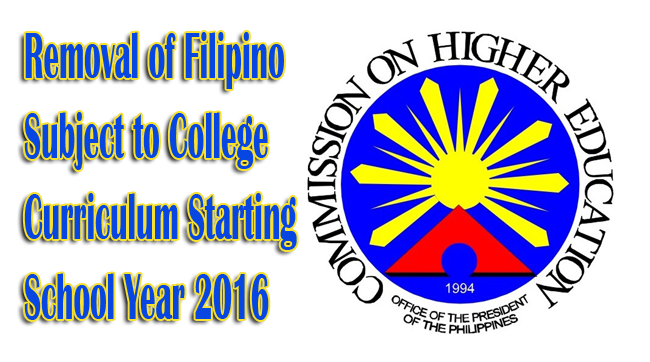 Commission on Higher Education finally decided to take out Filipino subjects from the college curriculum. This issue of removal of the Filipino subjects made an uproar in both teachers and students alike. According to the CHED Memorandum Order No. 20 Series 0f 2013, the college subjects Talastasang Filipino sa Lipunang Pilipino, Pagbasa at Pagsulat, Pananaliksik sa Wika at Kulturang Filipino will be moved to Grade 11 in accordance to the reformation of the basic education through K to 12. However, though this aims to give advance education to senior high school students, ther would be about 10,00 full time and 20,000 part time professors who would likely to lose their jobs. Most of these teachers had been teaching their respective subjects for decades. Prof. Wilfreda Legaspi of UP Diliman told Bandila that even those who are in higher education and in doctorates study Filipino to enhance their learning in their career. Filipino subject has a deeper and wider discipline. She then proceeded to question that why would they remove the subject in college while USA and China studies their respective language in their higher education. While for some, the change would be a disrespect for our culture and belittling of our language, some students think this is helpful since they have no use of it in college. They would rather focus on their major subjects than cram their time and effort in a subject that they have been learned since elementary.